It is estimated that globally over 8.7 million cubic meters of desalinated water is used for irrigation and over 3.5 million cubic meters of reject brine is produced every day. Therefore, it is extremely important to ensure safe disposal and sustainable use of reject brine. 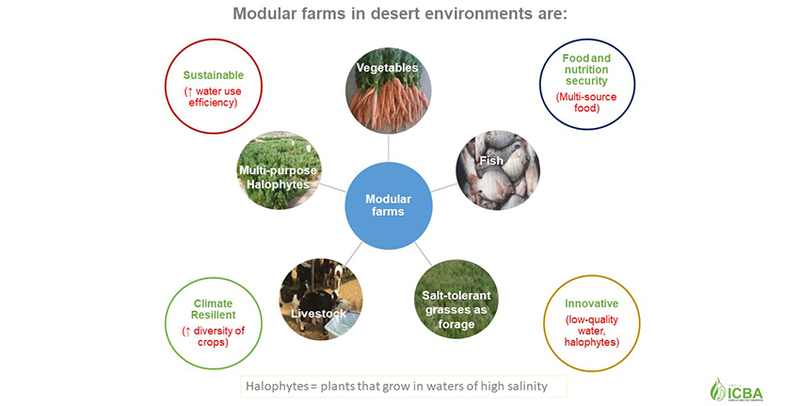 Modular farming approaches focus on exploiting reject brine for fish farming and production of halophytes (salt-loving plants) on inland farms, and seawater and aquaculture effluents for cultivation of halophytes in coastal desert areas, bringing into production degraded or barren lands with economic benefits for local communities. 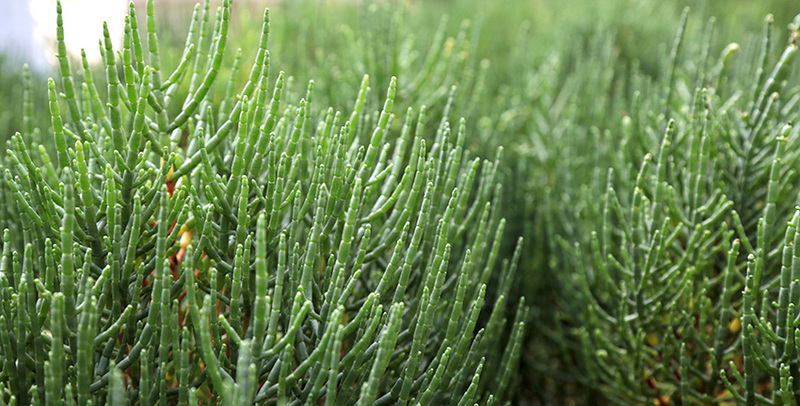 Salicornia is a halophytic crop with multiple uses. It can be irrigated with highly saline water and be used as a vegetable, forage and biofuel crop. Fresh water, which makes up a small fraction of just 2.5 percent of the total water available, remains the main requirement for human consumption and agricultural production. However, fresh water supplies are fast declining due to several factors including changing climatic conditions and population growth. This is alarming at the local, national and international level. It is estimated that globally around 70 percent of the freshwater is used for irrigation, 22 percent for industry and 8 percent for domestic use. Looking at the water footprints, a whopping 15,000 liters of water is needed to produce one kilo of beef, 1,000-3,000 liters to produce one kilo of rice and even a cup of coffee needs around 140 liters of water for its production (IFAD). Over the period to 2050, these finite water resources will be required to support billions of additional people as the world population continues to soar and is expected to go up by 31 percent from 7.5 billion today to 9.8 billion in 2050 as per the recent 2017 World Population Data Sheet from the Population Reference Bureau (PRB). Moreover, increasing temperatures and other effects of climate change continue to have devastating impact on fresh water resources leading to severe problems such as droughts, food insecurity and political instability. These negative impacts on water availability call for urgent action to allocate and use water more wisely and call for sustainable pathways for food and water security. Unfortunately, the Middle East and North Africa (MENA) region includes some of the world’s most fragile and water stressed countries posing critical challenges for policymakers to ensure water security and proper water management in the region. 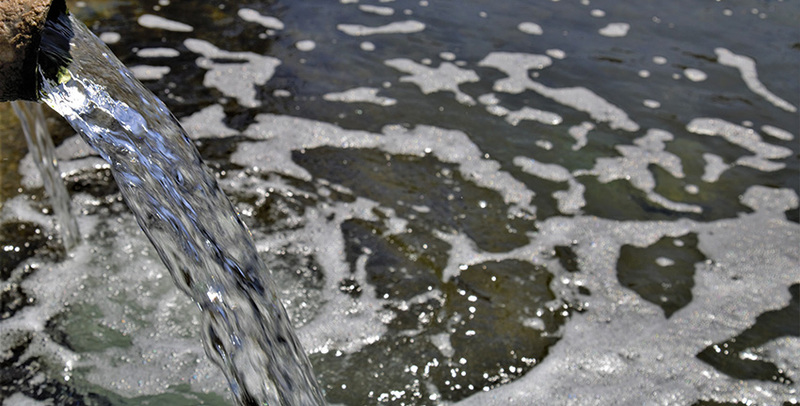 Evading further burden on the limited fresh water resources, several nations, particularly those in the MENA, have been increasingly deploying methods to use alternative water resources such as seawater over fresh water by removing salt from seawater, a process known as desalination. process, is dumped back into the soil and sea, thereby causing several environmental and health hazards, and negative impact on agricultural production and marine ecosystems. Estimates show that globally over 8.7 million cubic meters of desalinated water is used for irrigation and over 3.5 million cubic meters of reject brine is produced every day. It is expected that the demand for desalinated water in the Gulf region will increase in future (Dawoud and Al-Mulla, 2012) and the impact from reject brine will lead to fluctuations in salinity levels. As a consequence of brine discharge from desalination, Bashititalshaaer et al. (2011) forecast that salinity levels of the Gulf, Mediterranean Sea, and Red Sea will significantly increase by extra 2.24, 0.81 and 1.16 g/l in the year 2050. Another recent report from the World Bank Beyond Scarcity - Water Security in the Middle East and North Africa shows that brine discharge in the Gulf region from desalination plants is estimated to have increased ambient seawater salinity by about 20 percent. Furthermore, increased salinity levels of these seas will result in less potable water production from the desalination units for the same amount of energy input, meaning more cost for desalination. While challenges will remain daunting, the region has an opportunity to explore innovations and technologies available in the region. The Dubai-based International Center for Biosaline Agriculture (ICBA) along with its partners such as the United Arab Emirates Ministry of Climate Change and Environment (MoCCaE) provides an innovative solution by transforming brine discharge from a reverse osmosis (RO) unit into a valuable resource and profit for farmers through an approach called modular farming. The center has been running this project since 2013, and so far the results are promising and have shown that the innovation not only safeguards our environment, but also proves to be a great business model for farmers living in the MENA region especially for young entrepreneurs. Scientists warn that water quality has been getting negatively altered in the region and needs an immediate action. It is an undisputable fact that the quality of land and water has deteriorated over the last decade, thus farmers in the region need to move towards more innovative, sustainable and climate- resilient production systems to mitigate the growing issues. Dr. Dionysia Angeliki Lyra, a halophyte agronomist at ICBA and a lead scientist in the project, believes that modular farming systems offer a great advantage to utilize reject brine for fish farming, use seawater and aquaculture effluents in a sustainable way for the cultivation of halophytes (salt-loving plants) in coastal desert areas, and combine vegetables, forages and halophytes in inland farms. This integrated aqua-agriculture approach creates economic opportunities for local farming communities by using degraded or barren lands for improved agricultural production. With support from the United States Agency for International Development (USAID) and in collaboration with the International Water Management Institute (IWMI), ICBA has been studying the economics of the modular farms. The recent results have shown that due to multiple advantages of treated reject brine, there is a huge market potential when it comes to return on investment in inland and coastal farms across the UAE. For example, in inland farms, the fresh biomass yields of Salicornia, a halophytic crop with multiple uses, increased from 8 tons per hectare (t/ha) using reject brine to 24 t/ha by using aquaculture effluents. Also, the fresh biomass yields of forage grass increased by over 1.3 times from 56 t/ha to 75 t/ ha. Similarly, aquaculture effluents have been also used in coastal farms, where ICBA studies show an increase in Salicornia seed production by 3.25 t/ha – the highest yield obtained for domesticated Salicornia germplasm based on literature. In addition, the nitrate content in aquaculture water was 12 times more compared to seawater. The beneficiaries of this innovative project include farmers from the UAE who use desalination units for crop irrigation, farmers who use saline groundwater for fish farming, farmers in the coastal regions, and rural communities located in the MENA region, Mediterranean, Central Asia and South America that deal with land degradation, desertification and saline water resources. Due to its invaluable significance in the region, the innovation has been already recognized by international organizations and government agencies. The Expo 2020 Dubai’s Expo Live Innovation Impact Grant Programme provided a grant to ICBA to conduct an innovative research project on inland and coastal modular farms in the UAE. ICBA was among three organizations in the UAE and 29 global innovators from around the world to have won this grant in the initial round of the Expo Live funding. With growing challenges in the world, more innovations like modular farming are needed to ensure food, water and nutrition security for future generations. Among many other fields, the UAE is also taking the lead in providing sustainable agricultural solutions, thereby setting examples for other countries.